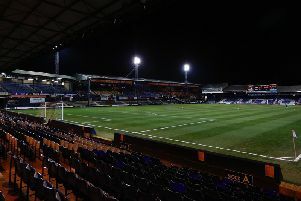 Luton Town stormed to a 4-1 victory over Crawley Town at Kenilworth Road on Tuesday evening thanks to an superb team performance. Here’s how the Hatters players rated on the night. Marek Stech: 7 - Thankful to the woodwork for keeping out Roberts in a first half where he had little to do once more. Good stop from Boldewijn although will be disappointed to lose out on another clean sheet so late on. Jack Stacey: 9 - Lovely burst forward to set up Berry’s strike as he pierced the Crawley midfield, picking his head up well to deliver the pass. Constantly motored up the right flank as he linked with Cornick, while also solid defensively. James Justin: 9 - In at left back with Potts out suspended and it proved a seamless transition. In the right place to clear the danger away when Crawley had a chance early in the second half, hooking away from the line. Glen Rea: 9 - Forming an excellent partnership with Sheehan and his positioning was impressive, making one brilliant tackle when it looked like the visitors were odds on to score. Distribution was key to Luton being on the front foot as well. Alan Sheehan: 9 - Defender handled the Crawley attacks, making sure he went up against Verheydt in the second period. Brought the ball out of defence well and constantly found Downes to feet. Flynn Downes (STAR MAN): 9.5 - An absolute masterclass from the 19-year-old at the base of the diamond. So calm in possession, has a trick or two and passes found their targets. Kept his head after an early booking and a brilliant goal-line clearance kept it 2-0. Olly Lee: 9 - Noticeably attempted more shots as Luton’s midfielders tried to take the pressure off their strikers. Forced a flying save, score his sixth of the season and had another instinctive long ranger fly narrowly wide. Some breathtaking late control when the game was won too. Luke Berry: 9 - Showed just what a fine eye for a goal he has, taking Stacey’s pass in his stride and confidently beating Morris. Sent over a number of crosses as Luton looked to get the ball in the box whenever possible. Andrew Shinnie: 6.5 - Just one of those evenings where it wouldn’t quite go for Shinnie. Can’t knock his willingness and determination to get on the ball, but control was just slightly awry. Harry Cornick: 9 - A constant menace from the word go as he skipped past his markers with ease giving the visiting defence a torrid evening. Denied by Morris and also the outstretched leg of Lelan too as he couldn’t get his deserved goal. James Collins: 9 - Scored two to take his tally to 16 for the campaign as he led the line well all night, with a fine break and assist for Lee. Could and should have quite easily been walking off with the match ball as he missed some excellent chances. Jake Jervis (SUB): 6 - Looked to open his account for the club, blasting a late effort over. Luke Gambin (SUB): N/A - On for seconds before whistle went.